Angela Maher first gave the sport of Figure Skating a try while she was enrolled in graduate school. “Growing up, I was always passionate about figure skating but the closest ice skating rink was nearly two hours away! So while I didn’t get the chance to skate as a child, I always loved skating and started taking lessons as an adult as soon as possible.” While her passion for the sport runs deep, she took about a ten year break from the ice to start a family with her husband that she met through Figure Skating. The two met in 2002 and now sometimes compete together in pairs. In fact, Angela and her husband Joel took home the gold medal in pairs at the 2017 Powerade State Games. Angela practices at the Polar Ice House in Cary. 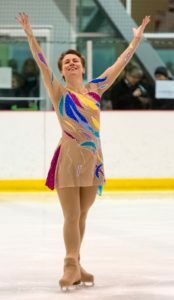 She is looking forward to competing in the Adult Silver Freestyle event at this year’s Powerade State Games Figure Skating Competition taking place on March 30th at Extreme Ice Center in Indian Trail, NC. Awesome- I will send this to Hank! !